Here is a review of my first experience using the Exact iDip Smart Brew water testing kit. I have had my eye on this kit for a while now, but it is pretty pricey, so I finally bought it while I was in Philadelphia at the Craft Brewers Conference since the vendor (Industrial Test Systems) was running a show special. 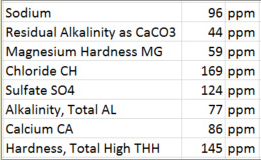 Since I started using RO water, I have been wondering how accurate the spreadsheets that I have used to build my water up back are. That was my main reason for the wanting the buy the test kit. I want to be able to test my custom water to see if the Bru’n Water and EZ Water spreadsheets are actually getting me to my desired mineral levels. While I have great respect for the people that have put the time and effort into creating those tools, I want to see for myself if I am actually brewing with the water that I think I am. After spending countless hours doing research on brewing water and reading the Water book twice, this was really the next logical step for me to take in my brewing evolution. I am brewing this weekend sometime, and I will do a final test then, but tonight I just tested my tap water so I could get used to the process. It does not do much good to test the RO water since the mineral levels are so low and the tests have a generally accepted range that they are good for. So, my plan is to test my RO water after I have added minerals back into the water. Here are the results that got tonight on my tap water. I’m not going to go into whether or not this result is good for brewing or not, but it is still interesting to see what my tap water is like. If you are like me, your tap water is a blend of water from different sources and the mineral content will change throughout the year. I got the advanced kit which also includes a pH meter which I did not use tonight since I don’t have the calibrating buffer solutions yet. The process is pretty straight forward. One of the reasons I liked this kit so much was the fact that it used Bluetooth to communicate with an app on your smart phone. The first step is to turn on the meter and open the app. Once the app recognizes the meter, you can select which test you want to perform. 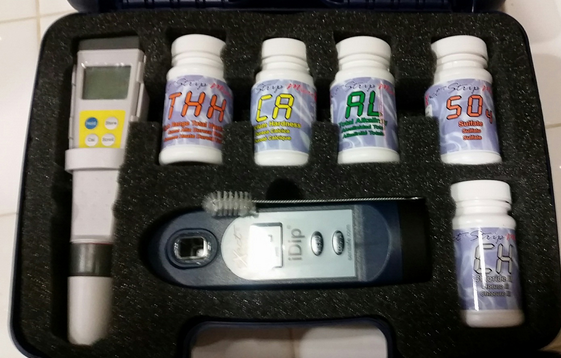 The way the device works is to put about 4ml of your water in the test reservoir. Each of the little bottles you see in the kit contains strips that are coated with specific reagents for that particular test. To test your water, you fill the reservoir, select your desired test in the app, and then use the corresponding test strip by submerging it in the test water reservoir for 20 seconds. The meter then reads the results. Pretty cool. After you have performed all the tests, you can save the results to the app. Once the test session is saved, the results can be emailed as a CSV file so you can open it in Excel. I am glad I did a dry run (or wet run) through the tests tonight. Now I will feel more comfortable with the procedures when I test my brewing water later this week. I would also like to be able test the water of other brewers in club. I will post again once I have the results from my brew water.